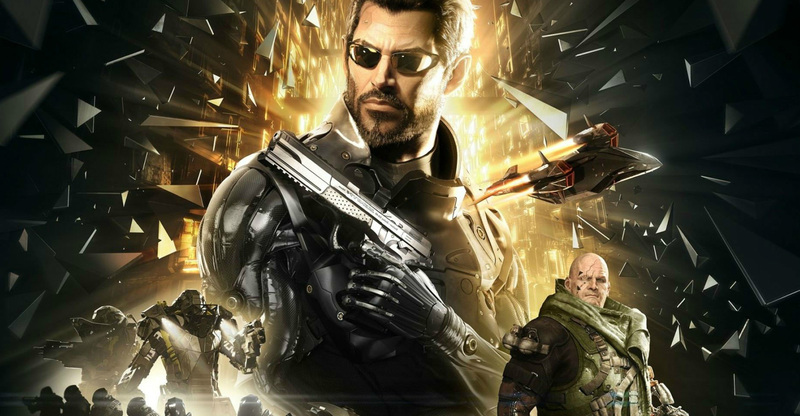 Adam Jensen trades all the luck he has for brand-new augments and an all-new adventure. The world is shattered. During the climax of Deus Ex: Human Revolution, philanthropist Hugh Darrow launched the Signal, temporarily turning augmented humans around the world into killing machines. What came to be known as 'the Aug Incident' split humanity. That event left Human Revolution protagonist Adam Jensen in a coma and he wakes up years later to find augmented humans as pariahs, shunted off into special cities under police guard. "I'm back. Did I miss anything?" Following a botched mission in Dubai, Adam finds himself living in Prague, one of cities where augmented humans are kept under close watch. Jensen is now a member of Task Force 29, an anti-terrorist group aimed specifically at augmented targets. Once again, Jensen is thrown into a vast game of cloak and dagger, involving various factions, including Task Force 29, the Augmented Rights Coalition, the hacking Juggernaut Collective, and even the Illuminati. Torn between these groups, who should he trust? Deus Ex: Mankind Divided clearly presents the plight of the augmented as a systematic campaign of harm perpetrated against them. There is really no grey area in what's happening to these people. The choice is how you as Adam Jensen react to the horror visited upon the augmented. Jensen himself seems mostly free of the effects of being an aug because of his position and general powers - Eidos wants the player to be mostly free to move around - so some of strength of the setting is blunted. There's the feeling that he just kind of leaves his augmented status behind is a way supporting characters or general citizens can't. The repeated question is: do you choose between your duty as an agent of Task Force 29 or your personal status as an augmented human? ("Clank" seems to be the slur of choice in-game.) It wasn't really a hard choice for me, but you may want to play a more 'by-the-book' version of the character. It's all up to how much human pain you wish to ignore in the pursuit of justice. The starting mission, Dubai, serves a few purposes. It gives players a look into the world Jensen now inhabits. It acts as a tutorial for first-time and lapsed players. It also gives you a taste of a fully-powered version of Jensen: using the Icarus Landing to drop from great heights, punching through walls, leaping through the air, standing in gas clouds without dying, and more. It's like a test drive so you can feel your playstyle out. Finally, Dubai serves to strip off all those goodies and 'reboot' Jensen. The reboot is a full part of the plot. While Jensen was kicking it in a coma, he got an upgrade. Players of the original Deus Ex or Deus Ex: Human will remember Augmentations, a large part of both titles. Jensen's augmentations return here, separated into seven categories: cranium, eyes, torso, arms, back, skin, and legs. What's contained in the categories largely makes sense: Cranium contains most of your hacking augments, Torso is all about your health and energy, most of your augmented attacks are on Arms, Legs helps you jump high and run fast. Back is probably the one that makes the least sense, including the safe-fall Icarus Landing and the room-clearing Typhoon missile system. Alongside updated versions of the classic augments, you'll also find the new Experimental augments. These are the hidden augments that were grafted onto Jensen in his coma and part of Mankind Divided is finding out who did so and why. The augments provide some of the stronger abilities Jensen has at his disposal, including the Titan liquid armor, a remote hacking ability, or the time-slowing Force Enhancement. The trick is using the experimental augmentations causes Jensen to use too much power and overheat. Overheating causes glitches, preventing some augments from working occasionally. This adds another layer on top of classic augment unlocking: you have to turn off some regular augments in order to equip more experimental ones. This sounds more painful than it really is. Early on, it's not an issue at all. As you progress and have enough Praxis Points to unlock everything, you'll start to run up against the some real choices, but by that point your playstyle is pretty much set in stone. And once you've unlocked everything, Jensen can seriously wreck some foes. Well, somewhat. Deus Ex offers the player a choice between stealth and combat, but it's still tuned more on the side of stealth. You'll eventually unlock the correct augments for some run-and-gun, but you'll be relying hard on those augments. You lack options to make Deus Ex really work like a real cover-based shooter - like the ability to peak your weapon out from behind cover - so the augments have to carry that extra weight. It's a different kind of cover shooter, with lots of stick-and-move around a battlefield. Open combat is better than Human Revolution, but it's still not completely equal to stealth in my opinion. Oddly enough, the in-game dialogue references your play-style occasionally. 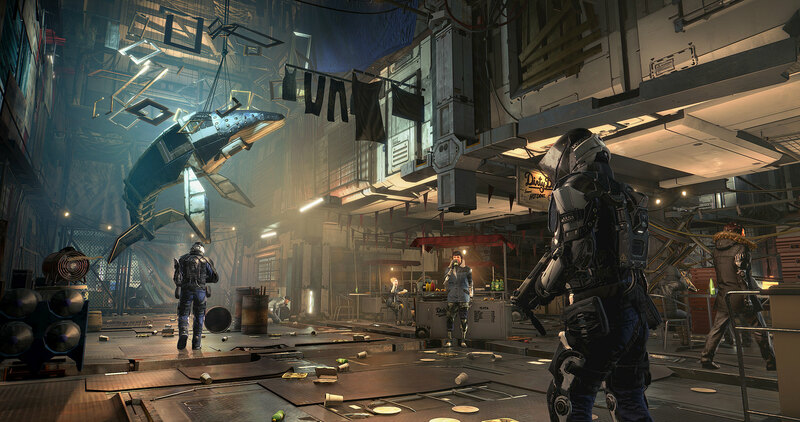 The stealth in Mankind Divided is the real meat and it's largely similar to what was found in Human Revolution. Though the game is primarily first-person, snapping to cover puts you into a third-person camera. There's still a press or hold option to decide if you're sliding along corners or jumping to completely different cover. 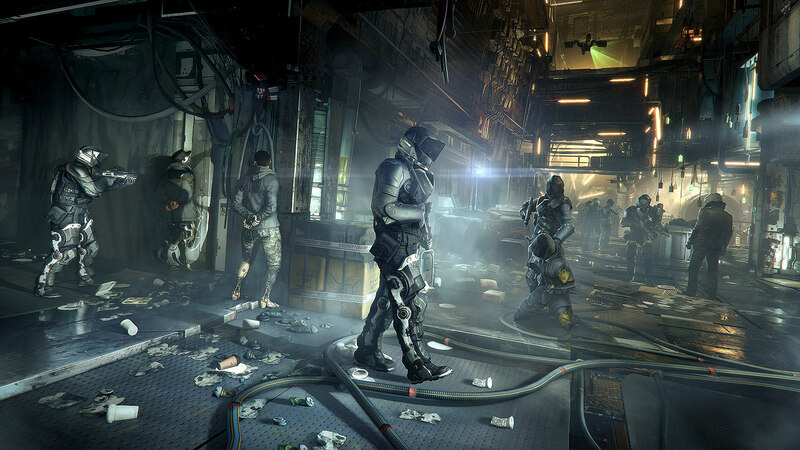 The only real difference is Mankind Divided now shows you your general path from cover A to cover B. You can move boxes and other items to make new cover, boost you into certain areas, or get all those dead bodies out of the open. Line of sight is the only thing you need to worry about, so if you're really good, you can actually move a box around as portable cover. And like Human Revolution, Adam Jensen will spend a good deal of time wandering around ventilation ducts. Basically, if you liked the stealth in Human Revolution, it's the same here, but slightly better. Even the takedown cutscenes are still here; they've gotten better, but I wish I could turn them off at times. The enemy AI flip-flops between supernaturally intelligent and willfully obtuse at times. They seem lost every now and then, but sometimes they can pinpoint exactly where you are, even if that makes little sense. Perhaps its the benefits of technology? 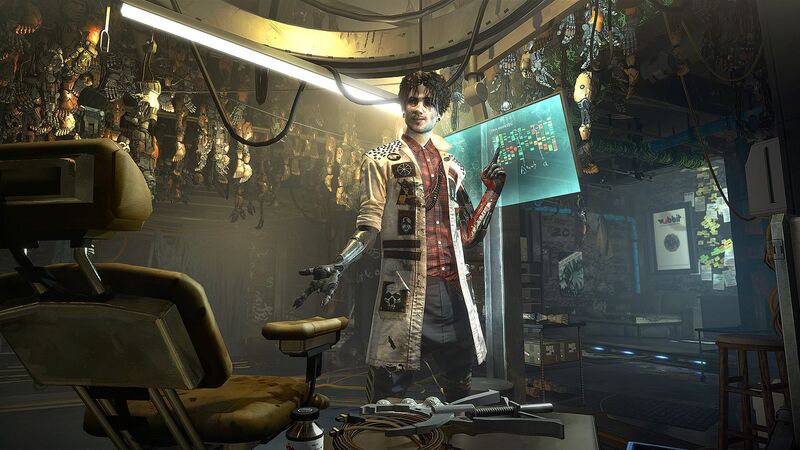 Deus Ex: Mankind Divided is powered by the Dawn Engine, an all-new engine built by Eidos Montreal. One area where the game is complete standout is the levels themselves. Not only is the game absolutely gorgeous, but Eidos Montreal's environment artists did a great job of creating places that feel real and lived in. They have a clear vision of the future and it shows. Prague isn't huge, but it always feels like there's something to do and little nooks to explore. The buildings themselves are older; this feeling of an older city with retrofitted tech is strong. Posters and ads litter the walls, giving you a glimpse into the reality of Jensen's world. The subway is ramshackle, with poor and destitute augs begging for food. You'll run across posh apartments, abandoned shops, nightclubs, underground tunnels, and government offices. While the distinct areas of Prague - accessible via metro rail - are all rather flat, there's a strong contrast to be found with the Golem City. This is where augmented humanity lives in real poverty. It's dark, filled with harsh lighting, and harsher treatment by law enforcement. Since the city was built by augmented humans, it can stretch higher than human buildings. Golem City is amazingly vertical and it feels far more dense than Prague does. It's a twisted melange of wires, neon, cloth, and metal. Golem City, from beginning to end, is a class act. Bravo, Eidos Montreal artists. The characters are solid as well. Adam Jensen sports a new armored look and brand-new trenchcoat. The rest of the cast is equally distinct, from punk rock doctor Vaclav Koller, your hacking contact Alex Vega, the paranoid Peter Chang, or the hulking augmented soldier Viktor Marchenko. (No Letitias this time around.) The animation does a great job of giving you some sort of insight into what each character is feeling in a conversation and it only falls apart a bit when it comes to lip-syncing, which travels way off the reservation sometimes. Otherwise, Deus Ex: Mankind Divided is a great looking game and one that stayed at around 60-50 FPS on my rig for the most part. (i7-4790, GTX 970, 16 GB RAM). 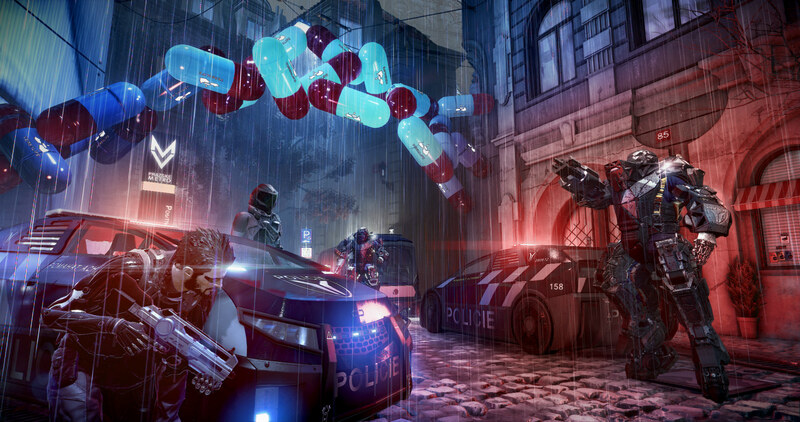 As an aside to the single-player campaign, Eidos Montreal also crafted the online-centric Breach mode. 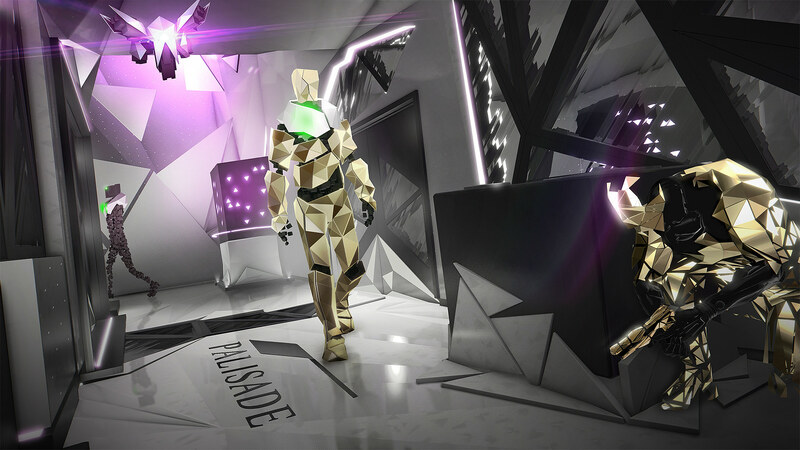 The mode portrays you as a Ripper, a hacker using a Neutral SubNet headset to hack security systems in virtual reality. Breach is essentially the Deux Ex: Mankind Divided's stealth gameplay, with a timer and a shiny, Tron-like aesthetic. You're tasked with hacking into the servers of various companies. Each level includes a certain number of sites you need to download data from while avoiding detection. Once you've gotten enough data, a breach is opened and you have a very short window to escape the server. Win and you get experience and the chance to win a booster pack. Each booster pack offers up weapon or equipment cards, which you can use to customize your character. Think of Breach as an online-connected, semi-competitive version of Metal Gear Solid: VR Missions for Deus Ex. If you like the stealth gameplay, this allows you to extend that experience forever. Eidos Montreal has a live team working on the mode, so more content will keep coming down the pipeline as long as players enjoy it. I like it, but I can't see myself sticking with it for more than a few weeks. Until then, I'm having fun. 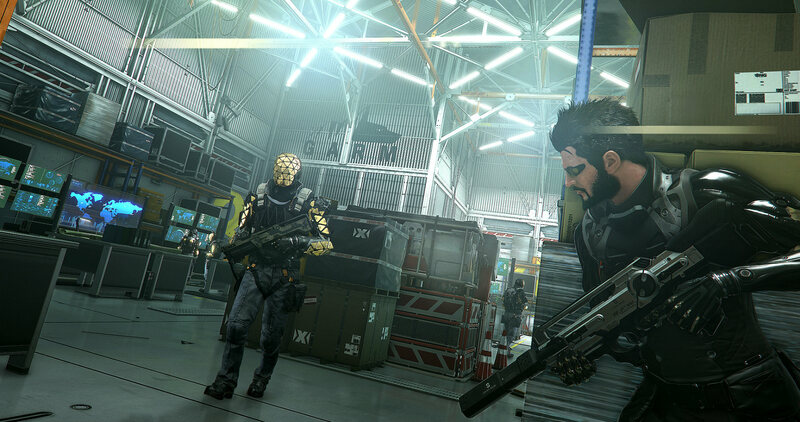 Deus Ex: Mankind Divided is a worthy follow-up to Human Revolution, which itself was a worthy follow-up to the original Deus Ex. Eidos Montreal has crafted a great stealth RPG that offers up some interesting moral choices for players. The studio's world building is amazing, from the cities you'll wander through to the small details that color them. It doesn't entirely stick the landing at the end, but I'll be damned if I didn't enjoy it all the way through. The developer did a good job of providing a number of shortcuts to easily access useful functions, like weapon switching. Breach is built to give Mankind Divided fans something to do long after the single-player game is over. Goddamn, this is a good-looking game. Adam Jensen returns in an all-new adventure, proving that Human Revolution wasn't a fluke. Eidos Montreal has outdone itself with the same great stealth experience, improved combat, and some gorgeous art direction. There's a whole host of augments and weapons, allowing you to customize your experience and certain moral choices you make will stick with you. 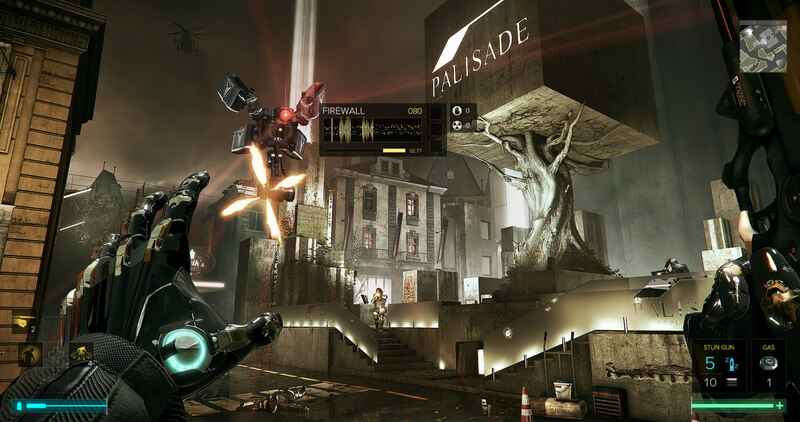 Deus Ex: Mankind Divided does not disappoint. Tagged with Eidos Montreal,	FPS,	PC,	PlayStation 4,	Reviews,	Role Playing Games,	Square Enix,	Xbox One.